Our outdoor electrical enclosures are often called for when installing a new power supply connection. We have an extensive range of pillars and cabinets, all suitable for an electrical connection. 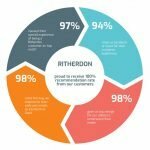 You’ll find them all under electrical enclosures, starting with the smaller cost-effective R Pillars. These are root mounted feeder pillars with lift-off doors from the R range with three different sizes or opt for the hinged pillars which feature a full perimeter IP 46 door seal (again three sizes to choose from) from our RH Pillar range. 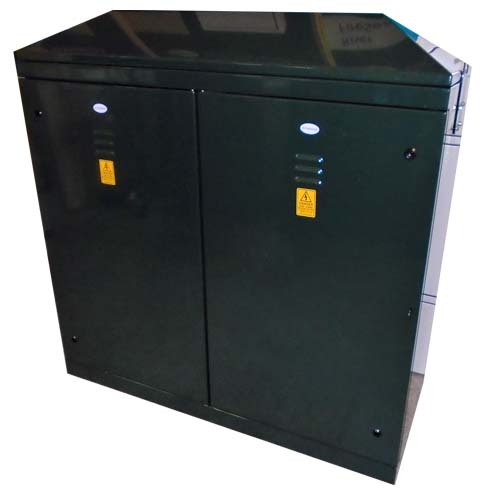 Moving onto bigger enclosures, our cabinets with optional plinths from the RB range available in 6 sizes and in single and double door versions, all feature a single compartment fitted with wooden backboards for electrical equipment. 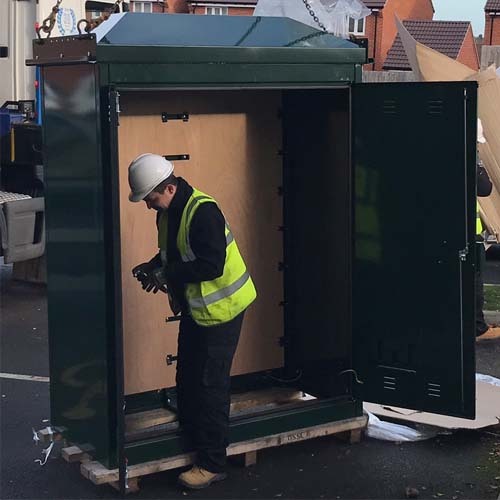 We designed and created, at Electricity North West’s request, 4 more enclosures which we have coined as Power Supply Enclosures. What sets these enclosures apart, is that they have segregated compartments. Each has individual backboards and can be locked independently. One side is for the consumer and the other compartment is for the electricity company (or what is also known as the DNO). They come in two sizes and are for permanent or temporary electrical connections. The permanent enclosures are the PS60 and PS300. The PS60 is a smaller enclosure or kiosk that is 1250mm wide by 1266mm high with a depth of 430mm. The two compartments are approximately 620 wide x 1000 high. Typically suitable for electrical connections of up to 60 kVA. The PS300 is a larger 2 compartment kiosk, with external dimensions of 1600mm wide x 2307mm high and 800mm deep. The two compartments are approximately 750 x 2000 high. Typically suitable for electrical connections of 300kVA. The temporary enclosures are the TBS60 and TBS300. They are the same size and design, except that we paint the Temporary Builders Supply enclosures red because of their temporary nature. 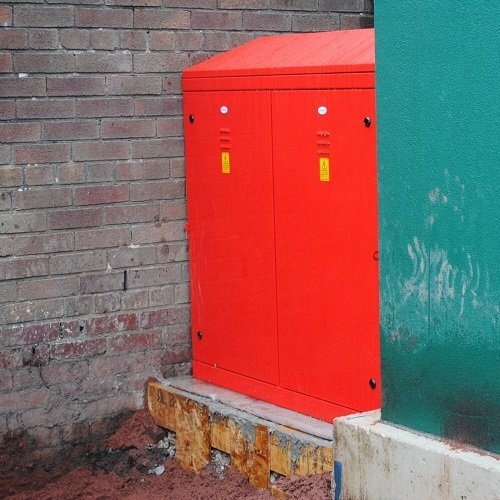 The red makes them stand out as a temporary item on a construction site. 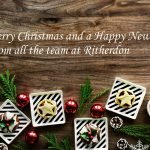 This is compulsory if you are installing a temporary connection in an Electricity North West (ENW) area as this is their requirement. The TBS60 is a smaller enclosure or kiosk that is 1250mm wide by 1266mm high with a depth of 430mm. The two compartments are approximately 620 wide x 1000 high. Typically suitable for electrical connections of up to 60 kVA. The TBS60 has one more advantage – it is made from 304 grade of stainless steel, a higher grade of material made to take more wear and tear than our standard 4003 grade of stainless steel. This is because due to the TBS60 size is designed to be used again, at another location after it’s first use. The enclosure is strong enough and easy enough to transport and handle on-site. Making the TBS60 a very cost effective solution for use on various building sites or on a large construction site to power different areas as works progress. The TBS300 is a larger 2 compartment kiosk, with external dimensions of 1600mm wide x 2307mm high and 800mm deep. The two compartments are approximately 750 x 2000 high. Typically suitable for electrical connections of 300kVA. Perhaps this is not what you are looking for? We also suggest browsing through our RB Cabinet range, for single and double door enclosures fitted with a plywood backboard for mounting electrical equipment. For a single phase supply to a building, we’d normally recommend the smaller RB600 or RB800 cabinet as the most cost-effective solution. 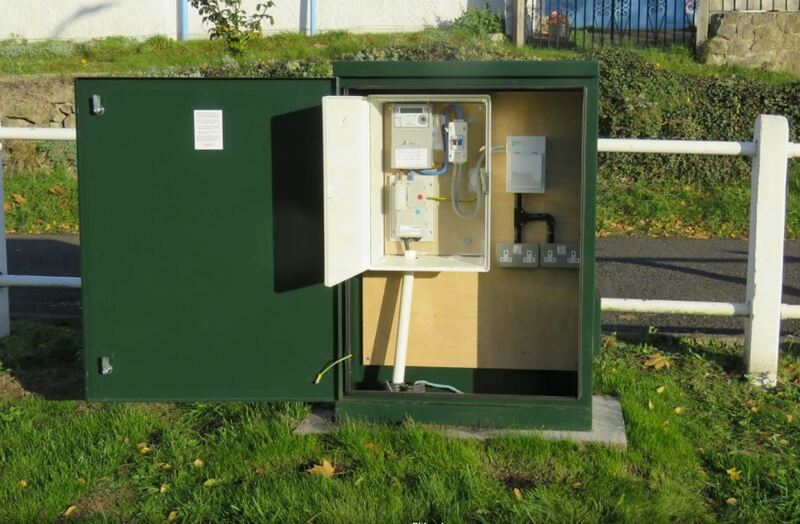 RB800 Cabinet housing a metered supply and separate sockets for electrical supply to the village green. Another option for your application maybe our RMC enclosures. The sizes available may be better suited for your application. These are our largest enclosures, with a single bay with no internal separation with a fitted plywood backboard. Make sure to get the external dimensions of the enclosure – height, width and depth and we can point you to closest size. If you take the backboard size, that will also help. Make sure you know what depth you require for the electrical equipment you will place inside the enclosure. 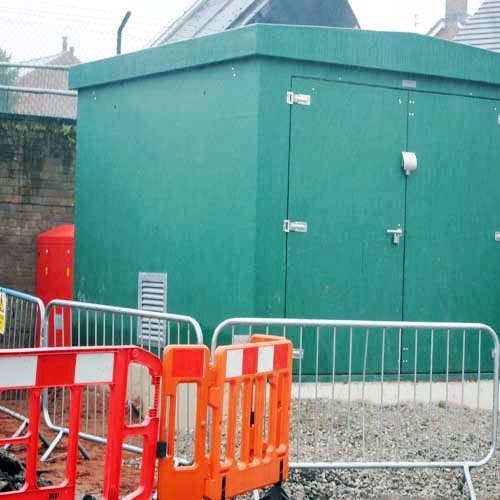 To make sure you are selecting the correct enclosure, we advise that you check with your DNO when considering a new connection. They will advise on the requirements for new connections, including the requirements for the enclosure. Browse this website or our online shop and give us a call if you’re unsure.